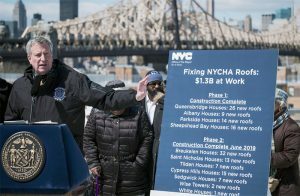 New high-powered LED “safety lights” in some NYCHA developments that are a centerpiece of the $210 million Mayor’s Action Plan for Neighborhood Safety are reportedly not reducing crime as dramatically as the city hoped they would. At four Brooklyn developments where they were installed at the beginning of 2017 — Ingersoll, Brownsville, Tompkins and Van Dyke — statistics indicated that crime was about 3 percent less than it had been the year before, less than the 10 percent drop in Brooklyn developments as a whole, according to Gothamist. And at Bushwick Houses, the lights have been on since April 2016, but violent crimes there decreased only from an average 3.4 per month before the installation to 3.3 percent afterward. “Some of these changes can be pretty misleading in either direction, since we’re really only talking about a few incidents a month,” said Dean Obermark, a research analyst at the Urban Institute. “My inclination would be to say it really looks like there’s nothing going on one way or the other.” And James McQuade, a resident of Ingersoll Houses, told Gothamist, “If you want to make trouble, you will, no matter what.” The lights have been installed at 15 developments citywide, six of them in Brooklyn.